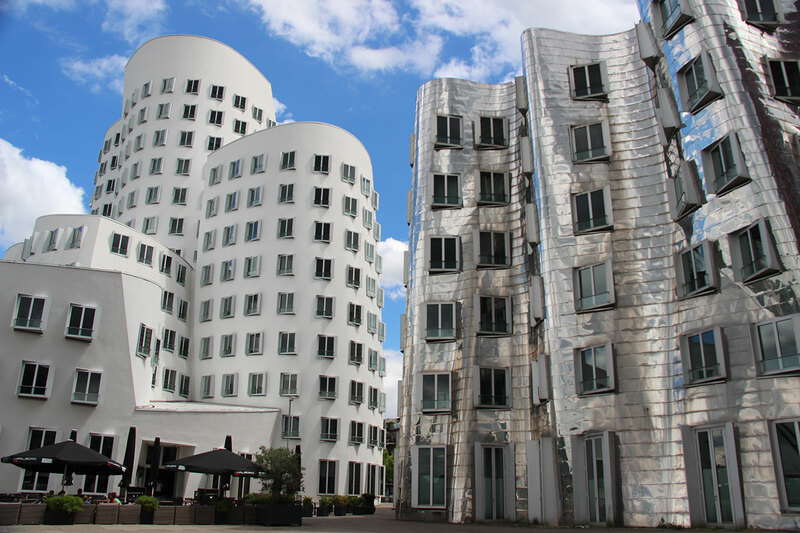 At this point, it’s safe to say that a Frank Gehry design is synonymous with urban revival. 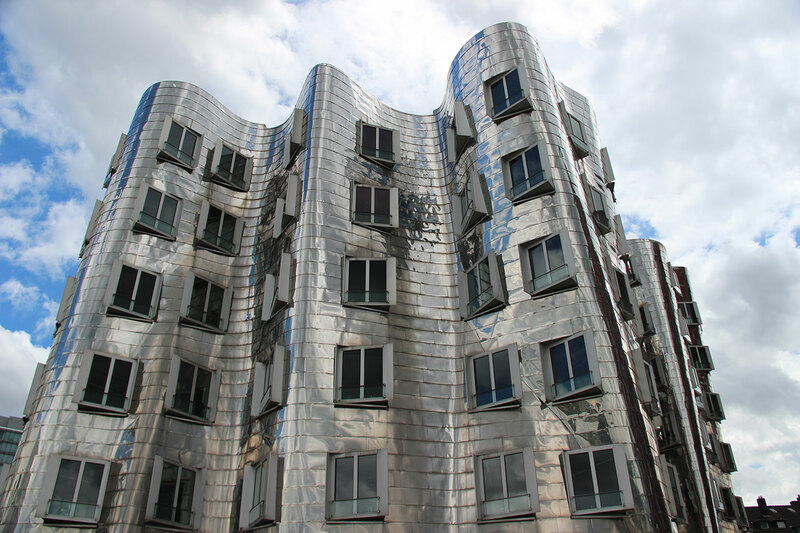 Rarely, if at all, has one architect been so adept at transforming a desolate area into a thriving, born-again community like the famed Pritzker Prize-winning architect. 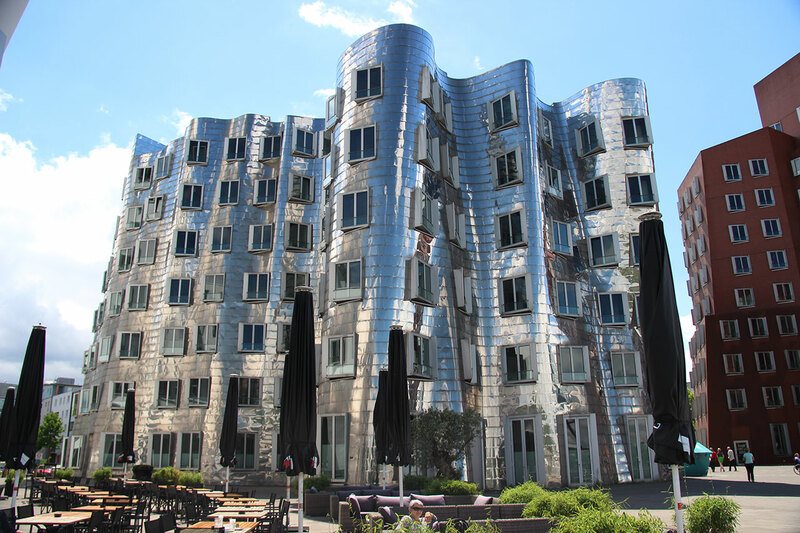 As proven by Gehry projects around the globe (such as the Guggenheim Museum in Bilbao, Spain), a Gehry project regularly leaves a tangible and lucrative impact on a city many years after the project’s completion. 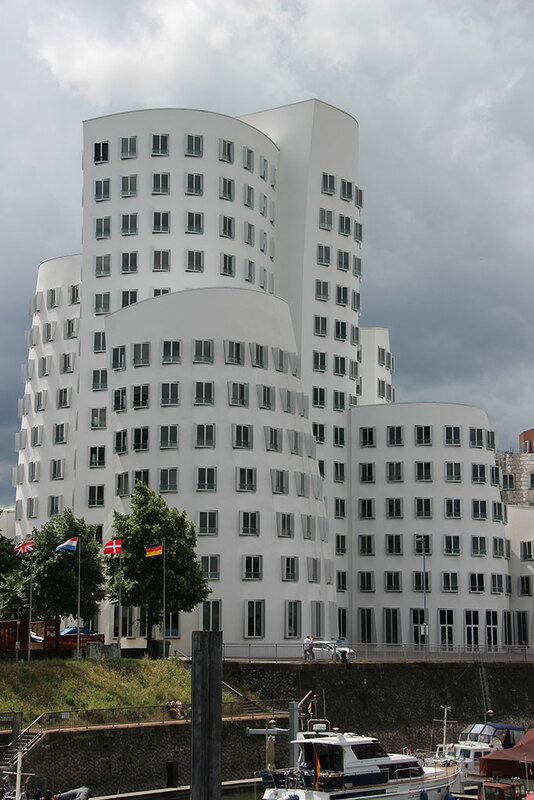 One such long-term success story can certainly be seen in Gehry’s participation in the renovation scheme for Düsseldorf’s Media Harbour. 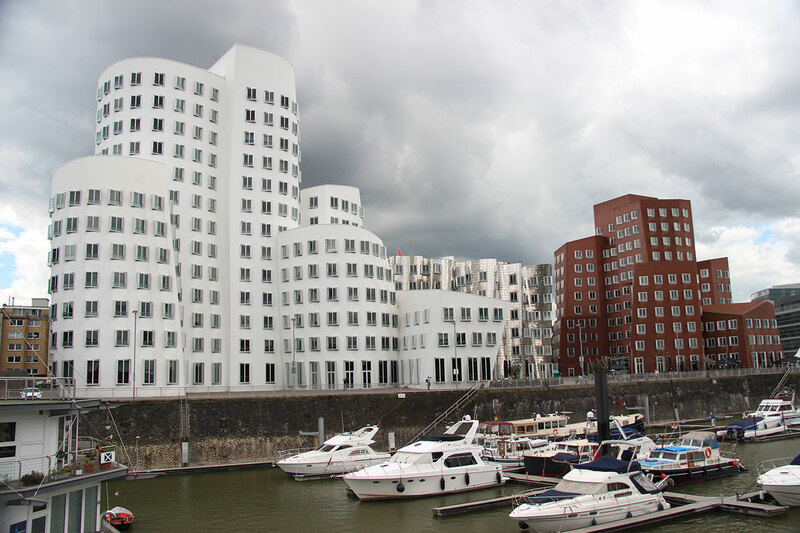 Located on the Rhine River and dating back to the 16th century, Düsseldorf’s East Harbour was once a bustling shipping and manufacturing center. The area fell into dramatic decline in the latter part of the 20th century due to a number of industry and market changes. Subsequently, the harbour and its surrounding area lost economic value and, over the years, became almost completely obsolete. 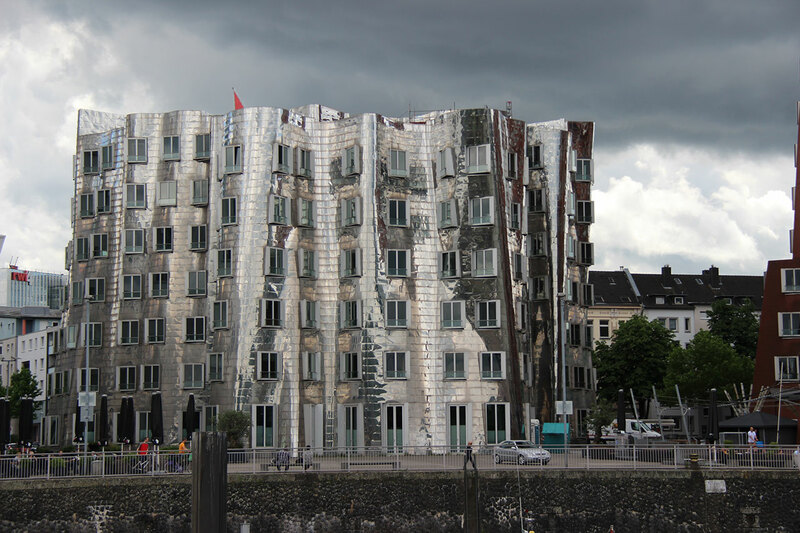 In the 1990s the Düsseldorf city council decided to focus on revitalizing the port area that runs along the extensive Rhine waterfront promenade. 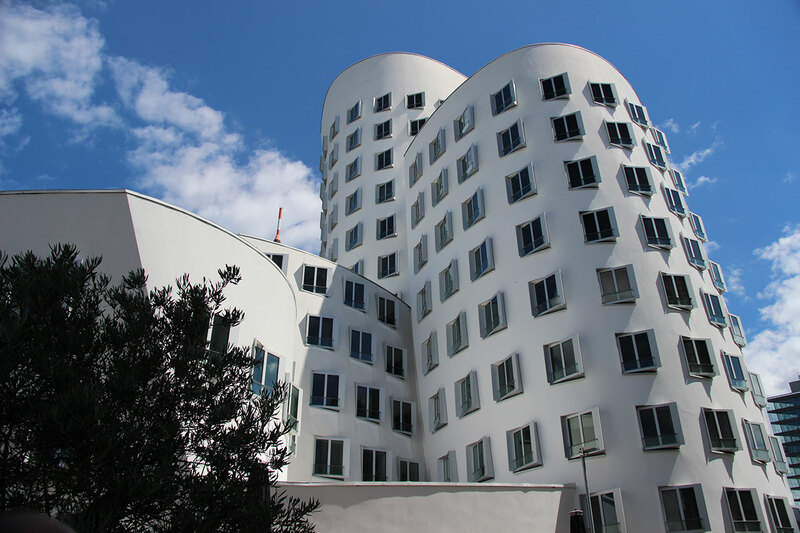 Of course, this massive renovation project was a fitting setting for one of Gehry’s deconstructivist designs, the New Zollhof Complex (Der Neue Zollhof). 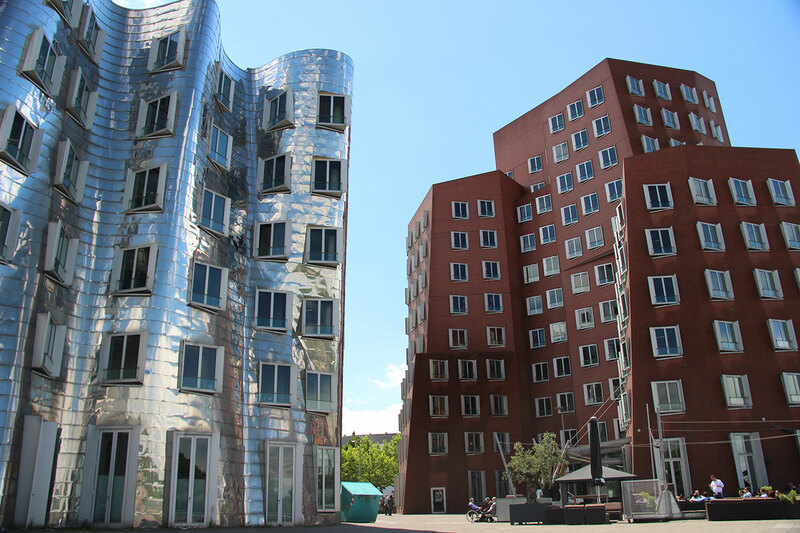 Today, this prominent Gehry design has come to represent the incredible metamorphosis of the Düsseldorf Media Harbour area over the last two decades. 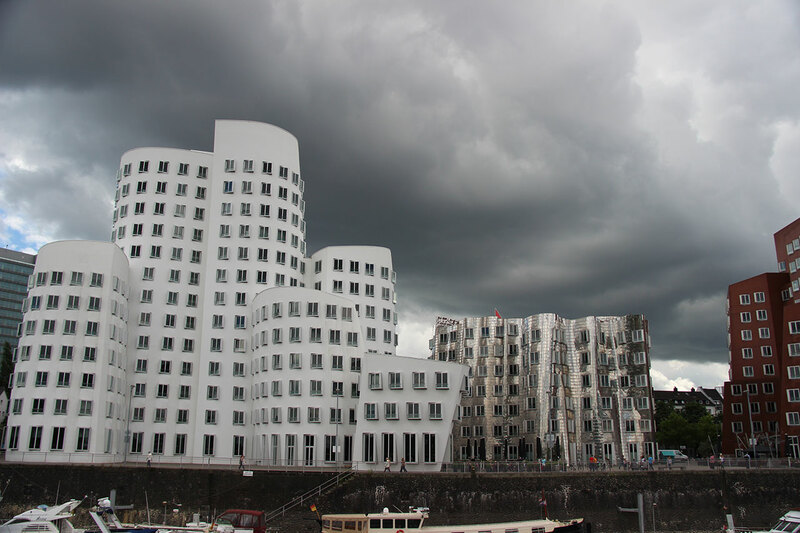 The Media Harbour is one of the city’s most popular landmarks, and the New Zollhof Complex is certainly one of Gehry’s most recognizable works. 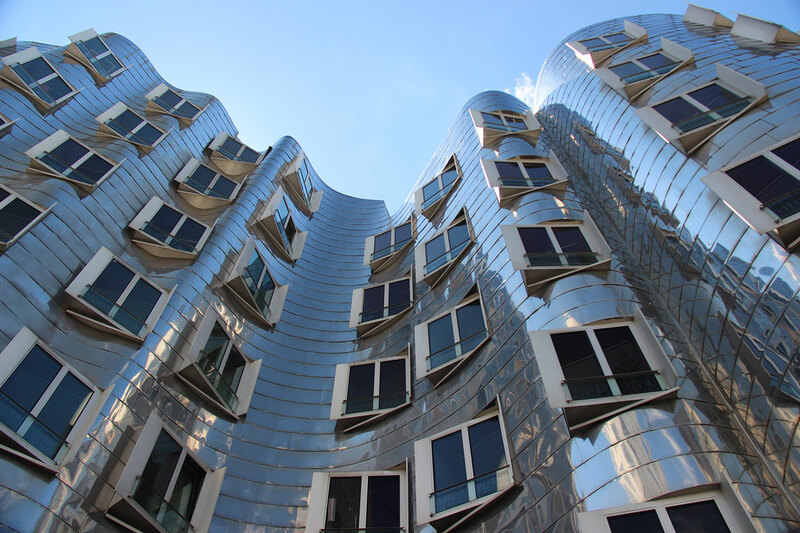 As a series of three distinct but corresponding buildings, the design is often referred to as the “twisted buildings,” and they are pure, singular Gehry: rhythmic undulating forms, severe geometry, and a disconcerting mix of humble and striking exterior materials. 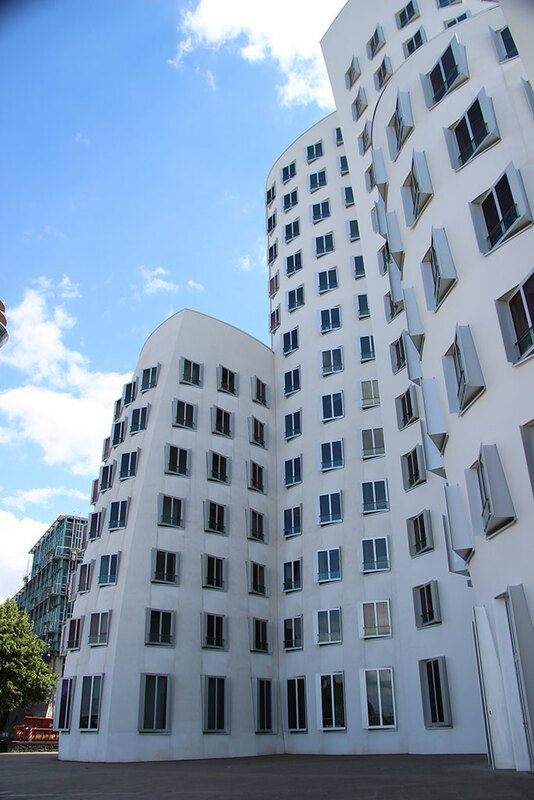 As far as similar characteristics, all three buildings are concrete-based structures and are equipped with identical protruding windows that allow residents to enjoy the beautiful water view. 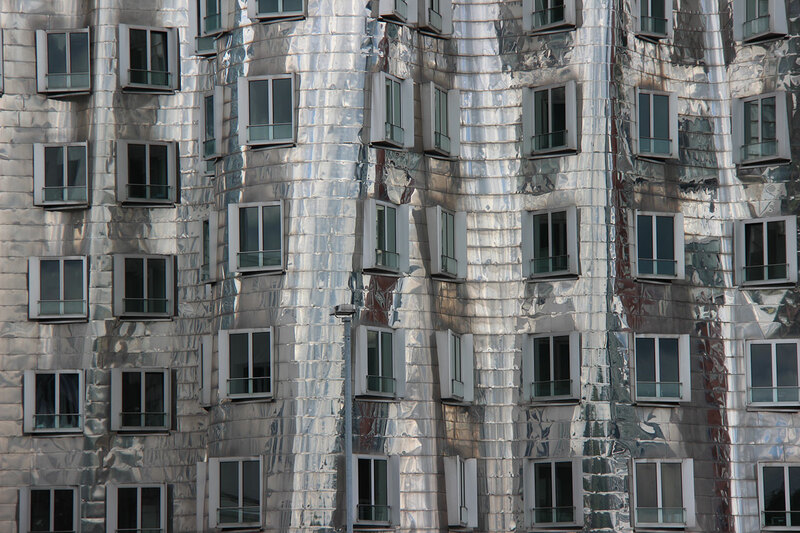 However, it’s the exterior cladding and Gehry’s famed disjointed symmetry that distinguish the three buildings from their surroundings. 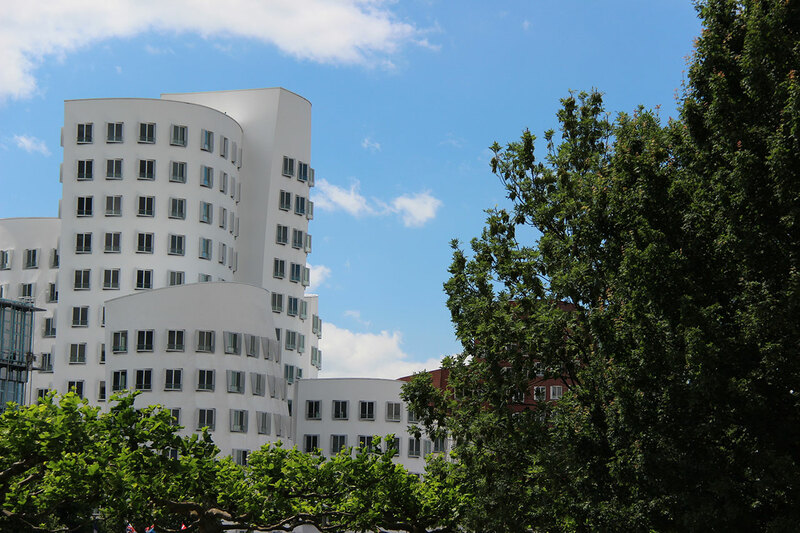 The west building is the tallest of the three at 14 stories and is coated in a striking white plaster, while the east building is a bit lower and covered in humble red brick. 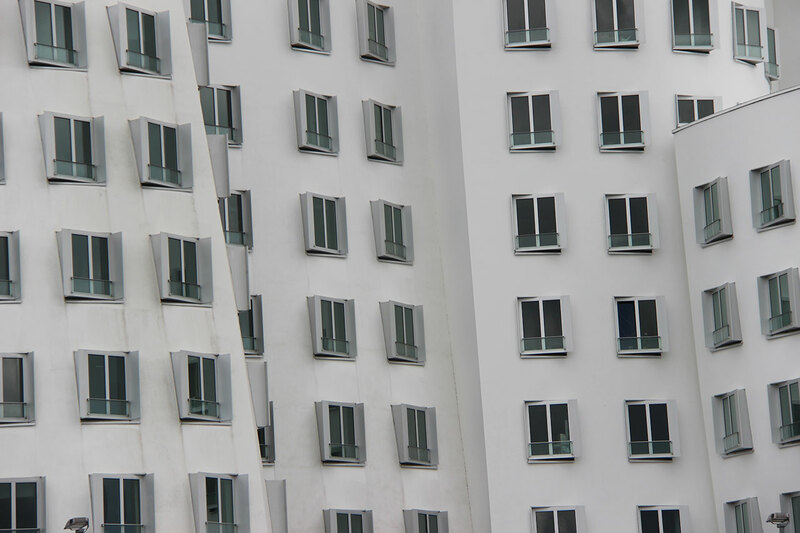 Both of these “end pieces” have a grouping of rounded or square slanting “towers” that jut upward and outward. 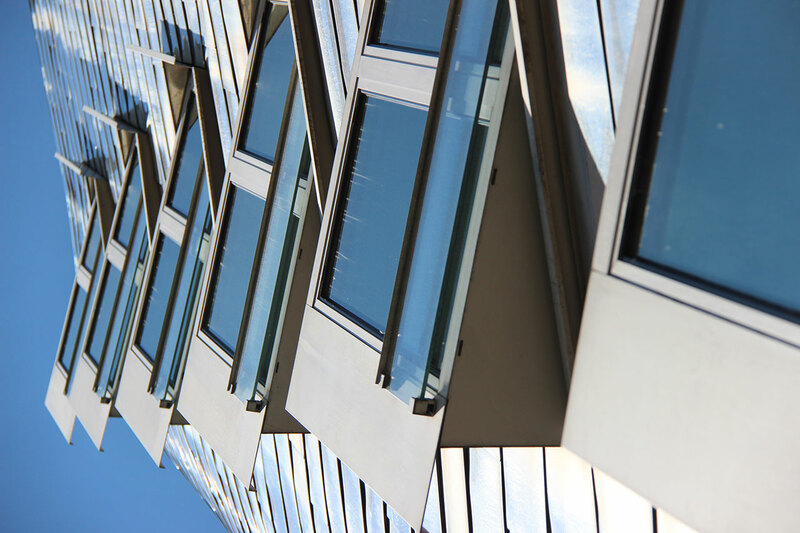 The glimmering, undulating central building is clad in reflective stainless steel panels that mirror the shape and exterior of its two counterparts on either side. 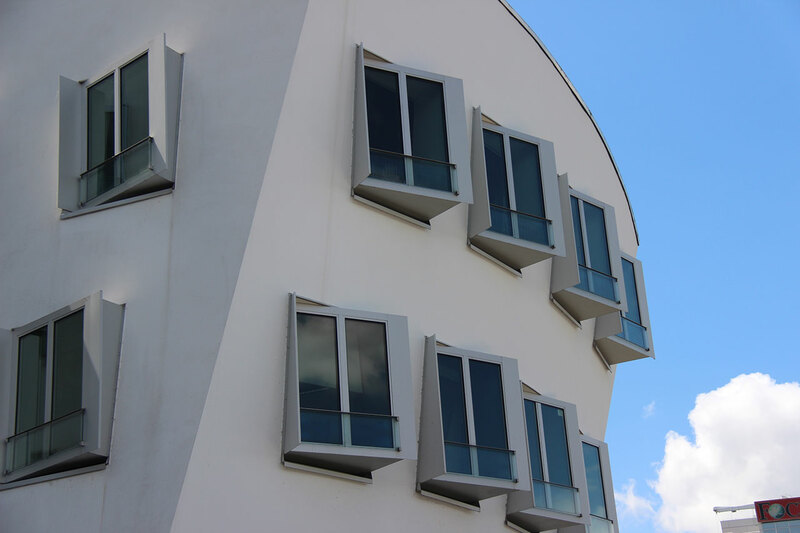 Through the use of similar characteristics like the positioning and design of the identical windows as well as the curvaceous nature of the two towers, the Media Harbour complex is clearly designed as a single entity. 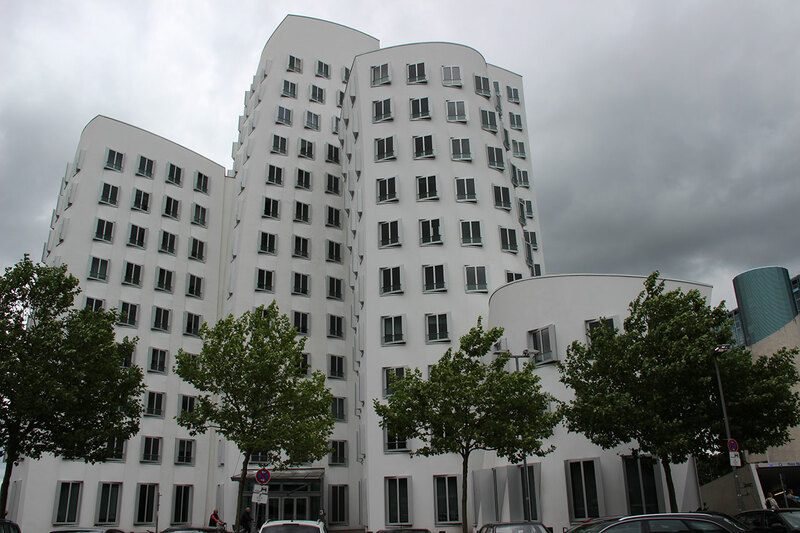 Yet, the use of contrasting materials and disproportionate shapes gives the complex a sort of unhinged, urban character. 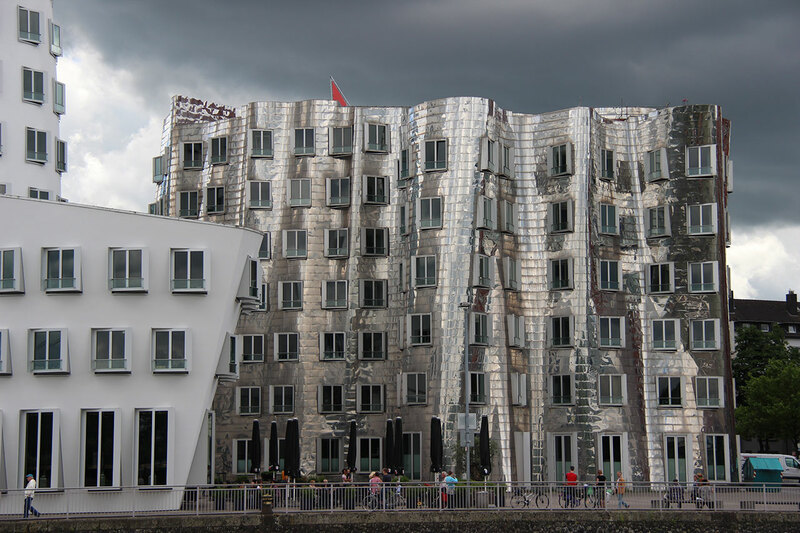 The result is an eye-catching and magnetic structure that is accessible to pedestrians strolling along the river walk. 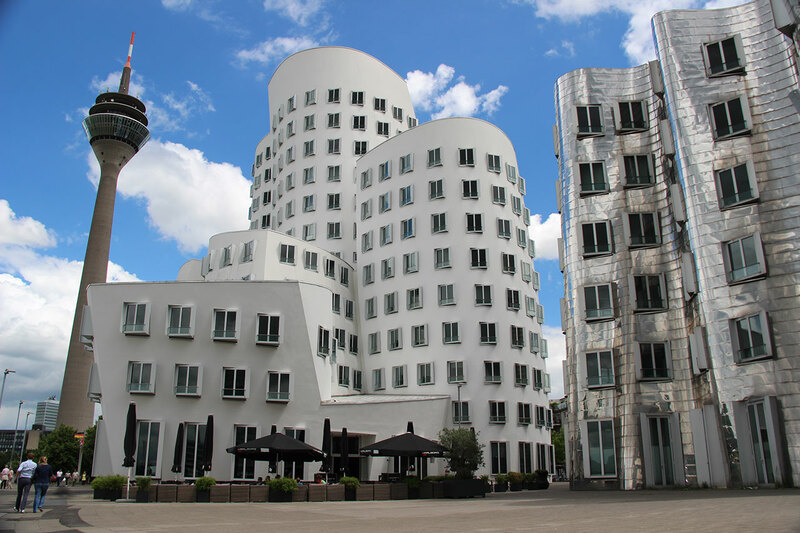 The Gehry name and progressive nature of the New Zollhof complex perfectly complements the vibrant atmosphere of economic growth and artistic creativity found in Düsseldorf. 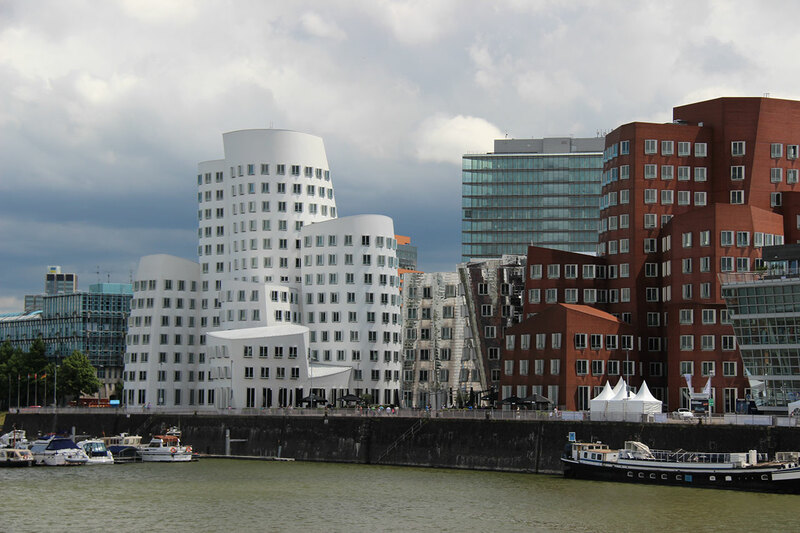 Since the inauguration of the three buildings in 1999, along with that of works from other renowned architects like David Chipperfield, Joe Coenen, Steven Holl, and Claude Vasconi, the renovated Rhine harbour area has grown into a thriving economic and financial center for the region, allowing it to become a highly valued attractor of new companies. 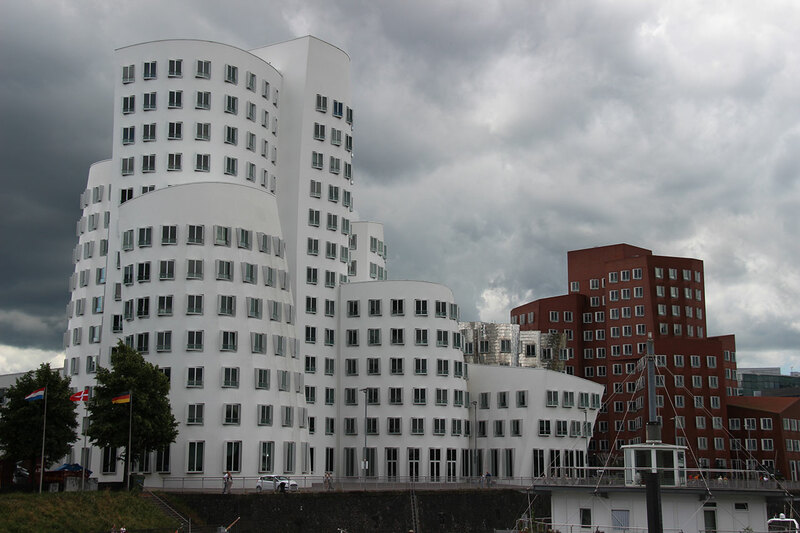 Today, the Media Harbour area is home to more than 800 international companies, many of which are in the media and communications sector, as well as various design, artistic, and cultural organizations. Nicole graduated from Georgia State University with a Post Graduate degree in Spanish to English Translation and a B.A. in Spanish and International Business. 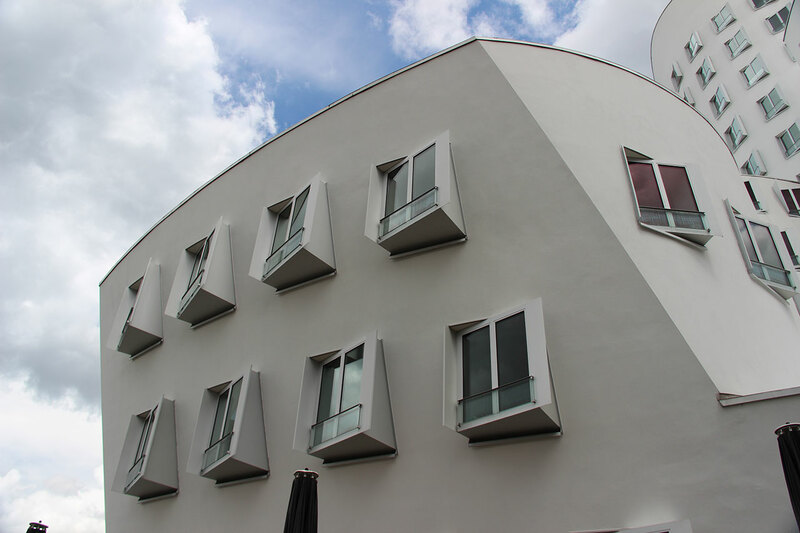 Presently living in Madrid, Nicole works as a freelance writer and translator and enjoys traveling around the Iberian peninsula taking photos of Spain's rich blend of historic and modern architecture. Her articles and photos have been published in various trade publications and websites.